The Association Agropolis International was founded in Montpellier 24 January 1986 by the research and higher education institutes located in Montpellier and the Occitanie area working in the field of agriculture, food, biodiversity and environment, with the support of the government and local authorities. This platform is open to the development of the Mediterranean and Southern countries; it also gathers a large range of stakeholders and partners of the economic development and from the civil society. 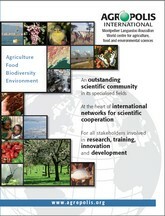 Providing a place for exchanges and the reception of partners, a common house for the regional scientific community involved in agriculture – food – biodiversity – environment issues. Accompanying the stakeholders involved in innovation issues and the economic development in their international activities.